I eat breakfast every day at my desk at work, and it’s my favorite part of my morning. Yes, my favorite part of the morning is eating… but it’s just a nice way to get into the day, a reward for waking up and driving all the way to the office, and you guys, it’s delicious. In a nutshell, I had to stop with the daily 2-ingredient dough bagels. They were making my stomach hurt, and making me stopped up. Yep, I couldn’t go to the bathroom at all… for days. As I type this, this seems reminiscent to pausing with poultry a few months back…but anyway, I had to drop the dough. As a non-egg eater, I had to find something different for breakfast that I actually like and not surprisingly, I leaned more toward a non-breakfast option, and you guys, I LOVE IT. The original version comes from everyone’s favorite cookbook author – Skinnytaste. Gina’s original version also included hard boiled eggs, which you could totally add if that suits you. My version is egg-less, pumped up with extra veggies, and I prep them a week in advance. 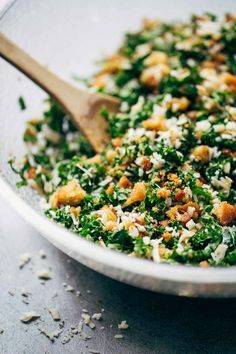 Don’t worry, kale is hearty enough that it doesn’t get soggy at all. Of note, you can squeeze some lemon/lime on your avocado if you are worried about the cut avocado turning brown. 1. Prepare your bacon per package instructions. 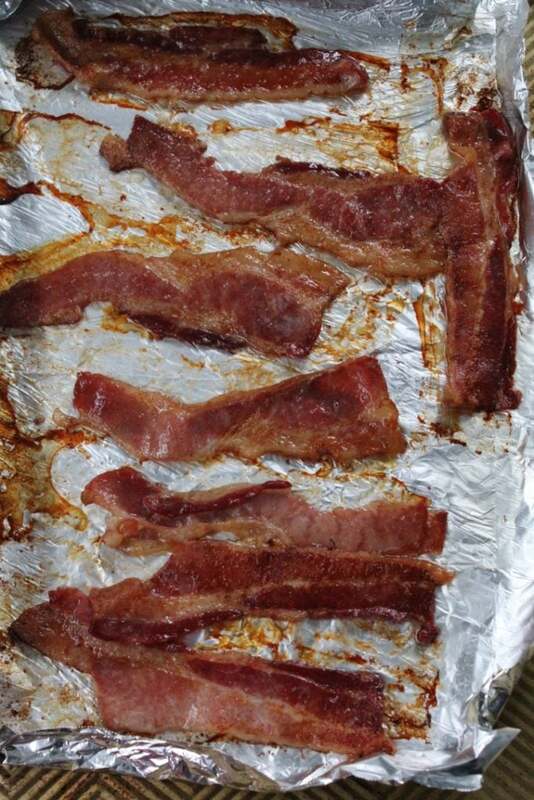 Remove from the oven to paper towels, and pat the bacon to remove excess grease. Chop the bacon and set aside. My favorite way to cook bacon is in the oven. 2. 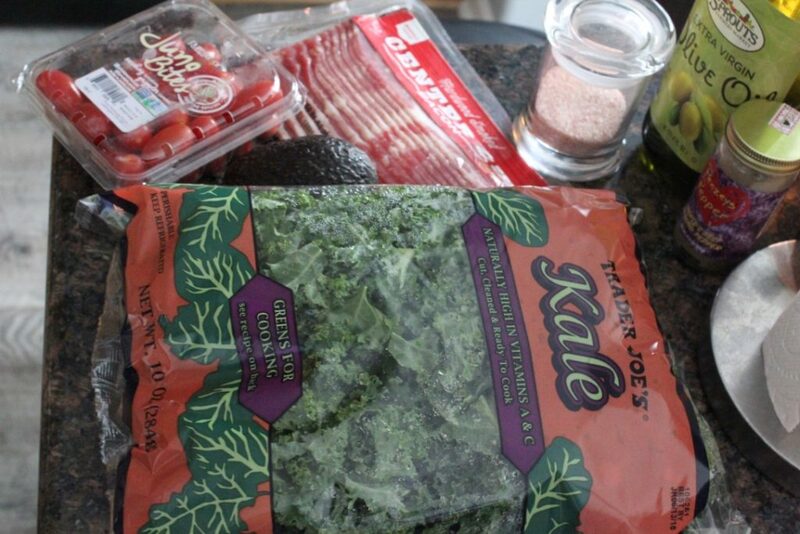 Prepare your kale by slicing it thinly, taking care to remove the stems. 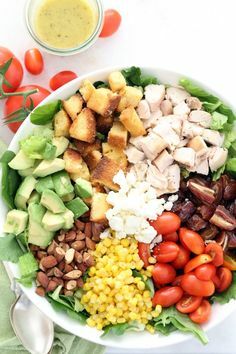 Place in a large bowl, and toss with oil and vinegar. Massage the kale with clean hands, and add salt and pepper to taste. 3. 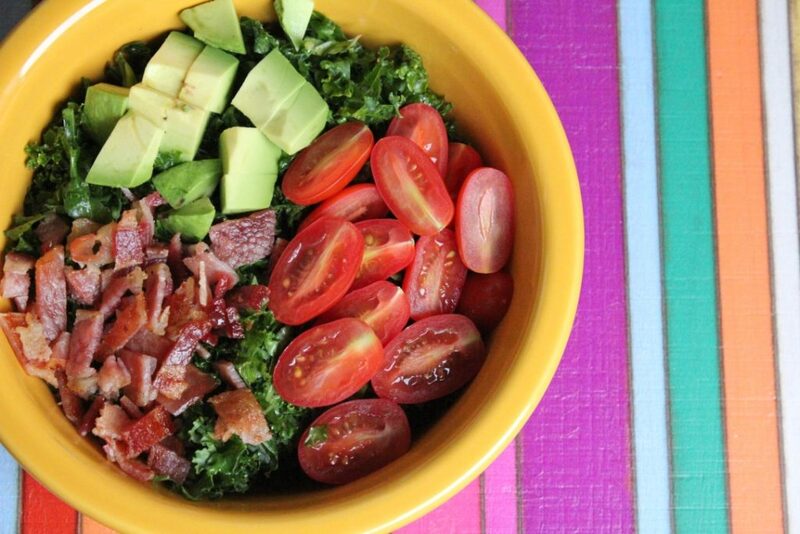 Assemble your bowls by adding 2 cups of kale salad to the bottom of the bowl. 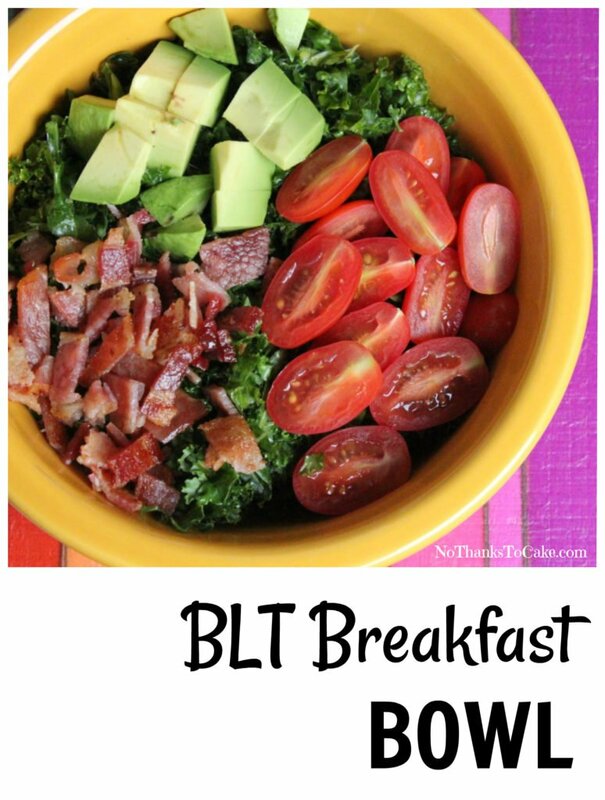 Top each bowl with 2 slices of chopped bacon, 1 oz. of avocado, and 8 grape tomatoes halved. 4. 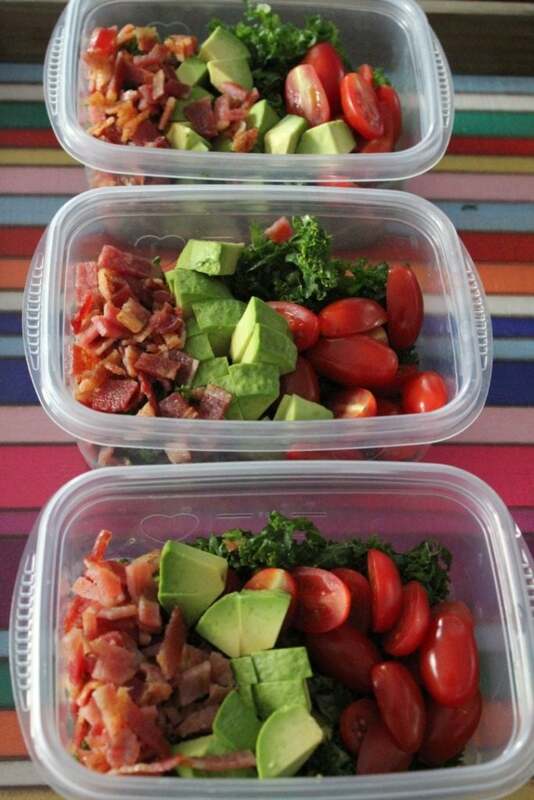 Food prep your salads and enjoy them all week long!